Salads are a great way to add healthy eating to your day but let’s face it, all those greens can get a little boring. We’ve got some great suggestions on how to take your salad to the next level of deliciousness, featuring Ambrosia apples, of course. 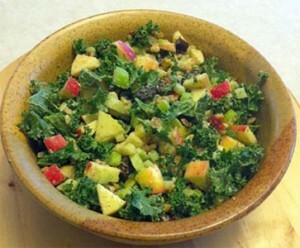 Ambrosia apples add a sweet crunch to any salad but keep it interesting with your presentation. We love to top our salads with Ambrosia cubes, shoestrings (julienned) and even paper-thin slices but why stop there? Try adding a little surprise by cutting a small hole in your apple cubes and stuff them with a pecan or walnut slice for an unexpected double crunch. Get spicy with a sliver of pickled jalapeno pepper. Or spoon in a bit of creamy feta – the salty surprise inside the sweet apple cube will have your dinner companions raving! Ambrosia apples are already a crunchy addition to your salad but if you’re looking for more crunch try some crispy Ambrosia apple chips. Making them is as simple as thinly slicing them (a mandolin will give you the best results) placing them on parchment paper and tray, and baking them at 225 degrees for an hour and a half. Want more crunch? Add some toasted kale or parmesan crisps to your toppings mix. Bake up some diced Ambrosia apples with mustard, oil and vinegar. This makes a great topping on a bed of greens (especially greens that have a bit of bite like arugula or mustard greens). It’s also lovely over grilled romaine halves. Toss on some crispy bacon or thinly sliced pancetta for that added wow factor. Vegetarians can go for toasted walnuts or pumpkin seeds to take this warm salad topping over the edge. Remember, there’s no such thing as a ‘boring old salad’ when you’ve got Ambrosia apples on hand.